- "L'histoire est un tissus de mensonges sur lesquels tout le monde s'est mis d'accord." Evidemment, cela prend un peu de temps. À qui profite le crime (pour autant que 'crime' il y ait) ? Qui en ce moment souhaite fixer le regard des Medias (et des Agences !) vers la gauche alors que l'Action se passe à droite (ou vice-versa) ? Suivez mon regard ... je me tourne vers ... la Crimée, l'Ukraine, Poutine !? Le timing cadre à la perfection ... règle n. 1, ne jamais croire aux "coincidences", dans ce métier il n'y en a pas ! Gérard de Villiers se retourne en ce moment dans sa tombe, de ne pas être en mesure d'écrire le 201-ème SAS titré "La dacha de Poutine" ? Donc, après la perte du contact transpondeur, pas de messages ACARS mais l'affirmation qu'il y aurait eu des contacts sans transmission d'informations ("pings") avec les satellites IMMARSAT, et un élargissement de la zone de recherches ... Tout ce qu'il fallait pour encourager les théories de complot, qui font rage sur A.net. Qq indices vus par les USA font étendre les recherches vers la mer d'Adamans, un destroyer US s'y dirige d'ailleurs ! C'est à un scénario de ce genre que je me raccrochais pour penser que les passagers sont peut-être encore en vie. Les probabilités sont minces je le reconnais volontiers. Pour ce qui est des suicides de pilotes, il y a des moyens plus radicaux sans tuer en même temps 238 personnes innocentes. Quand à une manipulation de Poutine pour détourner l'attention de la Crimée, y a des solutions autres que ce crime, mais il en est certainement capable et le choix d'une ligne asiatique simplifie les choses ! Le satellite spot V en position sur la Malaisie. La solution de vector peu etre réellement envisageable dans cette region. Tiens, une en Fr pour changer un peu ! Ce n'est pas vraiment une solution, une simple hypothèse basée sur l'espoir. Pour moi l'espoir c'est de retrouver l'avion, son épave du moins ... et de mettre la main sur les boites noire, pour avoir une explication à ce sinistre ! 14 March 2014: Inmarsat has issued the following statement regarding Malaysia Airlines flight MH370. 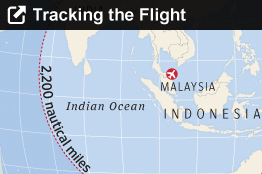 Routine, automated signals were registered on the Inmarsat network from Malaysia Airlines flight MH370 during its flight from Kuala Lumpur. This information was provided to our partner SITA, which in turn has shared it with Malaysia Airlines. For further information, please contact Malaysia Airlines. Merci, j'avais vu, les heures d'émission (Le plus important) C'est réservé à Malaysian, et au vu de leur gestion de la crise ... on n'a même pas idée de ce qu'ils en feront ! Oui mais les Américains, ils les ont les heures et les positions. C'est même la raison pour laquelle ils poursuivent les recherches en mer d'Adaman, sans doute pas pour le plaisir. The investigation into the disappearance of Malaysia Airlines Flight 370 sharpened its focus on sabotage, according to aviation and industry officials, amid strong indications that one or more people on the plane deliberately changed its course and tried to mask its location. Officials suspect two different systems were shut off after the plane took off last weekend, one shortly after the other, people familiar with the investigation said. About an hour into the flight, the plane's transponders stopped functioning, making it much more difficult for air-traffic control personnel to track or identify it via radar. In the ensuing minutes, a second system sent a routine aircraft-monitoring message to a satellite indicating that someone made a manual change in the plane's heading, veering sharply to the west. Such a turn wouldn't have been part of the original authorized route programmed in the flight-management computer that controls the autopilot. Those system-monitoring messages are suspected to have been disabled shortly afterward, according to some of these people. "Increasingly, it seems to be heading into the criminal arena," said Richard Healing, a former member of the U.S. National Transportation Safety Board. The latest revelations about the investigation, he added, "indicate the emphasis is on determining if a hijacker or crew member diverted the plane." Despite the efforts to hide the location of the Boeing 777 with 239 people on board, the plane kept broadcasting its location hourly via a satellite communication system for five more hours, according to several people familiar with the investigation. The last of these transmissions was sent from high above the Indian Ocean, according to two of these people. The international search has drastically expanded its mission westward, with the U.S. Navy and other nations now searching for the plane in a 320,000-square-mile rectangle west of the Andaman Islands. An official criminal investigation hasn't been opened, and an international team of investigators hasn't ruled out the possibility that some type of catastrophic event, pilot error or mechanical malfunction was the cause of the plane's disappearance. The Federal Bureau of Investigation has looked into the backgrounds of the passengers and pilots, a U.S. official said, but hasn't found any ties to terrorist groups or other indications they may have tried to hijack or sabotage a plane. Still, as details emerge an accident appears increasingly unlikely. The first loss of the jet's transponder, which communicates the jet's position, speed and call sign to air traffic control radar, would require disabling a circuit breaker above and behind an overhead panel. Pilots rarely, if ever, need to access the circuit breakers, which are reserved for maintenance personnel. A physical disconnection of the satellite communications system would require extremely detailed knowledge of the aircraft, its internal structure and its systems. "Everything so far makes it seem as though someone was controlling the airplane" and attempting to fly it somewhere other than its intended destination, said Robert Francis, another former NTSB member. The longer the search goes on, he said, the less it seems to be "what you would expect from a civil-aviation aircraft in trouble." Also emerging as a possible focus is whether more than one person on board the plane may have been involved in its disappearance. The satellite pings stopped roughly five hours after the other systems stopped working, cutting off all identifying signals from the plane. Aviation investigators are trying to determine, among other things, whether someone would have had to climb into an electronics bay located on the plane's lower deck to disable that equipment. It's also possible that the satellite communication gear, rather than being disabled, stopped sending pings because the plane had crashed some time after the final transmission. U.S. aviation experts say one challenge, especially if a criminal probe were ordered, would be getting Malaysian government officials and investigators to avoid mixed messages, confusion and friction with other countries. A series of false leads and conflicting radar reports has prompted criticism of Malaysian investigators after a week of mostly fruitless searching. Hong Lei, a Chinese foreign ministry spokesperson, chided Malaysia for not sharing information just three days after Beijing asked the country to accelerate its probe and speed up its search efforts on behalf of the families of passengers on the flight. Of the 239 passengers on the plane, more than 150 were Chinese. Malaysian authorities said they are working with experts from the U.S. and will receive help from a British team, composed of the country's Air Accidents Investigation Branch and engine maker Rolls-Royce, said Azharuddin Abdul Rahman, director-general of Malaysia's Department of Civil Aviation. Defense and Acting Transport Minister Hishammuddin Hussein said investigators will probe why the plane's transponders, which send signals about the aircraft to identify it to radar, went off. The NTSB has three accident investigators on site in Malaysia to help with the investigation. The group is headed by Don Lovell, a safety board veteran, a person familiar with the investigation said. Also on the Malaysia team is Scott Dunham, an expert in air-traffic control and radar. If a criminal probe is launched, the FBI is likely to send in a phalanx of agents and other personnel. Such a probe is likely to involve many countries but aviation experts believe it would be headed by Malaysia because of the aircraft's nationality. One U.S. official said Friday that pursuing an international criminal investigation would be "a huge challenge" because so many governments will have an interest in the process and outcome. WASHINGTON, March 14, 2014 /PRNewswire-USNewswire/ -- "PRBA shares the concerns about the fate of Malaysia Airlines flight MH370, the passengers and its crew. Until it is determined what happened to the aircraft, it is premature to speculate about reasons for its disappearance. As of now, PRBA has not been informed by any federal or international transportation agency about any investigation of lithium batteries onboard the missing aircraft. A rush to judgment before any facts are presented that explain the disappearance of flight 370 is both irresponsible and unwarranted." Le premier ministre de la Malaisie fera une annonce sous peu semble-t-il. À 01h30 pm heure locale. Bracing for what sources say will be a "big announcement" from Malaysian PM Najib Razak, who will come to 1.30pm #MH370 press conference. Les radars militaires ne sont pas sûrs à 100 % de leur côté ils donnent 50% de fiabilité à leur détection et suivi, pour ce cas ! KUALA LUMPUR, Malaysia -- A Malaysian government official says investigators have concluded that one of the pilots or someone else with flying experience hijacked the missing Malaysia Airlines jet. The official, who is involved in the investigation, says no motive has been established, and it is not yet clear where the plane was taken. The official spoke on condition of anonymity because he was not authorized to brief the media. 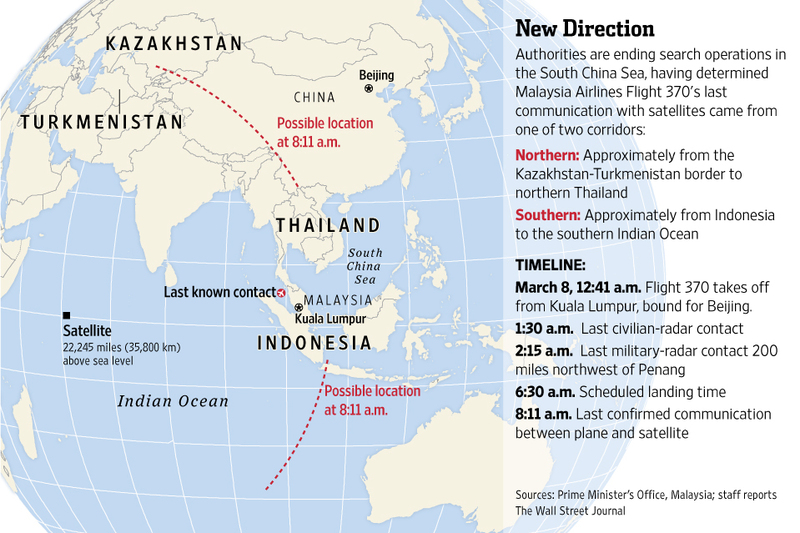 Kuala Lumpur — Malaysian Prime Minister Najib Razak told a press conference Saturday the missing Malaysian airliner's main communications were switched off and its deviation from course was "consistent with deliberate action." Najib said the last satellite contact from the plane was more than six hours after primary radar was lost, but added there was no confirmation the plane had been hijacked. En attendant .... plus beaucoup de com's Aviation, le B772 perdu de Malaysian occupe tout l'espace ! La question est maintenant de savoir si l'avion s'est écrasé ou pas (et où). Paul a écrit: La question est maintenant de savoir si l'avion s'est écrasé ou pas (et où). Entre nous, pourquoi l'auteur du détournement aurait-il volé 4 heures ou plus pour aller s'écraser dans l'océan indien ? S'il voulait se suicider, il avait largement le temps de le faire avant. Selon les traces, il se dirigeait vers les îles Andaman et Nicobar et a pu trouver un terrain isolé. Dans ce cas, il vaudrait mieux que ce soit un pilote confirmé aux commandes pour réussir un atterrissage (mais le 777 a démontré qu'il était solide à SFO). Il était peut-être attendu. On ne dit pas combien de carburant il avait à bord, mais sans doute pour 3500 à 4000 nm pour aller à Beijing. Cependant, il a dû se poser ou amerrir dans l'heure qui a suivi le dernier ping. C'est aussi vrai que la cargaison était peut-être le motif du détournement, mais dans ce cas, il valait mieux se poser correctement ! L'avion a changé plusieurs fois d'altitude (plus de 13 100m, c'est-à-dire au dessus de l'altitude normale, et également moins que l'altitude de croisière). Peut-être suite à un combat à l'intérieur de l'avion. Ou pour éviter des radars (haute altitude), ou éviter une rencontre avec un autre avion ? Ou pour (plus de 13 100m) entraîner une dépressurisation, et une inconscience des passagers (qui devaient pour la plupart être endormis, puisque c'était la nuit) ? Quelqu'un ici s'y connait-il dans le système de pressurisation, l'automatisme des masques à oxygène ? Les masques descendent quand l'oxygène descend en dessous d'une limite ? Quand la pression baisse en dessous d'un seuil ? Si celui qui détourne l'avion veut obtenir la moindre résistance des passagers, va t il préférer déconnecter la pressurisation, ou monter au dessus de l'altitude normale ? Senior Afghan official on whether #MH370 flew over Afghanistan: "We do not have a radar. Go and ask the Americans." ACARS was turned off before the last radio contact between #MH370 pilots and ATC. #MH370 departed with "planned fuel", without any addition: Malaysia Airlines chief. Les points rouges représente les aéroports compatibles avec le 777 avec l'autonomie de l'appareil. Un article intéressant sur les "satellites pings"
Suivez le WSJ c'est eux qui offrent, et de loin, la meilleure couverture. Paul pour ne pas être détecté il faut une ile avec une vieille piste de plus de 1000m et personne sur celle ci cela diminue déjà les possibilité géographique "zone pacifique" Avoir des contacts donc avoir organiser le kidnapping de l'avion. Cela reste d'une grande fiction hollywoodienne.